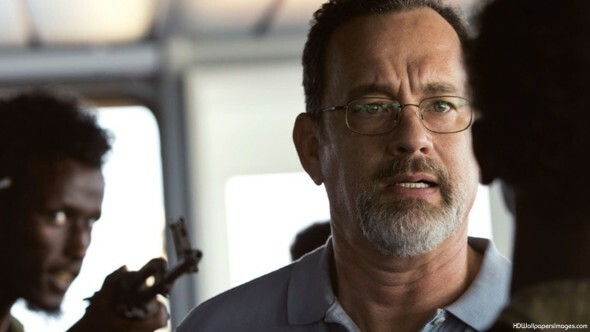 If the story of Captain Phillips wasn’t true, someone in Hollywood would have dreamed it up for a new Paul Greengrass adventure film starring Tom Hanks. That movie would have been pretty good. The reality-based version, though, is pretty great. In 2009, Phillips was at the helm of the Mearsk Alabama when it was attacked and boarded by Somali pirates. Failing to take control of the ship, the pirates took Phillips hostage, holding him in a lifeboat for days until a Navy SEAL team did what Navy SEALs do. As this is not a documentary, some of the details may be exaggerated, a fact which takes nothing away from the film’s effectiveness. Greengrass (The Bourne Supremacy and Ultimatum, United 93) utilizes the shaky camera movements and extreme closeups he’s known for to create solid tension early on, and then to slowly increase the pressure as events unfold. In much the same vein as the fact- based films Argo and Zero Dark Thirty, Captain Phillips chronicles a crisis from recent history, and tells the story well enough to make you bite your nails over an outcome you already know. Ironically, that story gets off to a bit of a rocky start. In setting up a contrast between the respective worlds of Phillips and the lead pirate Muse (Barkhad Abdi, in a stunning acting debut), Greengrass and screenwriter Billy Ray (The Hunger Games, State of Play) seem a bit hurried. Not only is Phillips’s pre-trip routine very reminiscent of Hanks’s pre-flight scenes in Castaway, but, more importantly, in attempting to explain the attack, the opening minutes skirt with reducing the entire ordeal to little more than black savages against white heroes. If you’ll pardon the pun, the ship is righted once the attack begins. From the moment Phillips spies the pirate boat through his binoculars, the tension is palpable. Greengrass creates an effective hide-and-seek between the pirates and the crew of the Alabama, culminating with the capture of Phillips himself. The claustrophobic depiction of the days inside the lifeboat, mixed with scenes of a rescue being planned and implemented are nothing short of gripping, as Hanks delivers what is possibly the best work of his career. His status as Hollywood heavyweight and all around swell guy has at times made it easy to forget that Hanks is damn good. This performance slaps the memory back into you. Hanks gives Phillips the humanity needed to ground a tale such as this, and drives the entire film into your psyche with one of the finest depictions of post-trauma shock ever seen on film. By the time you are breathing a sigh of relief, you can’t imagine the story of Captain Phillips in better hands.